Day by day, social networking sites usage is becoming more. The web sites or the mobile apps are leveraging the social networking sites sign-in functionality to log in to their systems. In this article, we will see ‘how to set up twitter sign in for applications’ using twitter-4j by following the below steps. 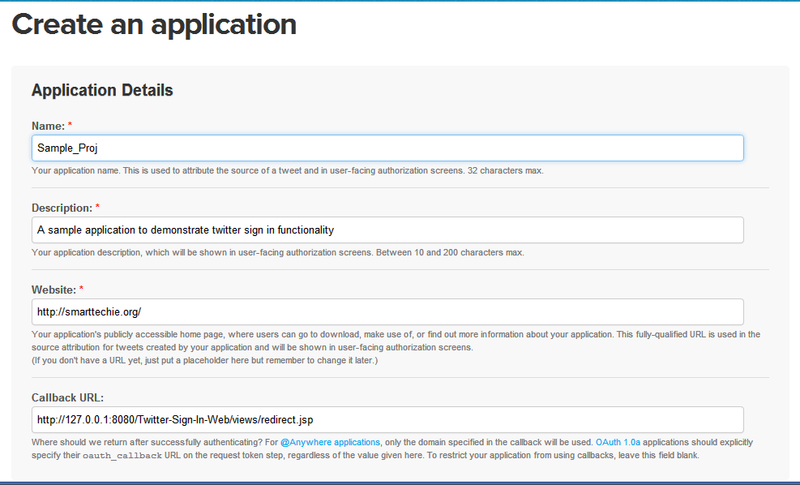 Step 1: Create an application in https://dev.twitter.com/ by proving the application name, description, website URL and the callback URL(see the below screenshot). The callback URL is required to redirect the application, once the authentication is successful with Twitter. Step 2: After creating the application, go to the application and change the settings(choose the “Access” and check “Allow this application to use the sign in with twitter option). Step 3: Go to the application and collect the “Consumer key” and “Consumer secret“. Step 4: Download the twitter4j distribution from http://twitter4j.org/en/ and put twitter4j-core-3.0.3.jar in the class-path. Step 5: Write a Servlet or JSP to use as part of “Callback URL“. In this example, we will go with JSP(In the step1 screenshot, you can see the callback URL pointing to the same JSP). Step 7: Write a JSP by putting “Sign in with Twitter” image. When the user clicks that image, we will call /signin Servlet(Created in Step6). In the above JSP, we have included a JS file called “twitter-login.js”. The code is given below. Once the user clicks on “Sign in with Twitter”, the Twitter Sign in prompt will appear. Once the user gets authorized with Twitter, the request will redirect to the “Callback URL“. Inside the “Callback URL”, we can get the authorized Twitter user id. Based on that, we can get the entire user object(look at Step5). The source code available here. Thank you! This really helped me. Thanks for finally talking about >Sign in with twitter using Twitter4j | Smart Techie <Liked it! you will be a great author.I will remember to bookmark your blog and may come back from now on. I have found something which helped me.